Today’s Spacetrawler was written and drawn by the amazingly talented and funny Alan Ryan of Faraday the Blob. I love this strip and feel you all should too. It has a twisted quirky dark humor… creating almost a discomfort I suppose — a car wreck your insane uncle who is driving is telling you is okay to laugh at. 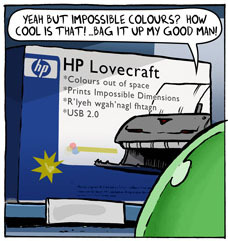 The first strip I read of Alan’s, or perhaps the first which caught my eye was his HP Lovecraft “Printer of Darkness” strip, which totally got me hooked. And there is so much else. So definitely, check out his site and trawl the archives. Who would want to miss the Zombie Aporkalypse, or an explanation nobody will ever believe, or how redecorating decisions are made in Life’s a Picnic, of being that Alan is Irish he aptly deals with any rainbow myths you may hold with Rainbow’s End, or have fun with Mr Elf’s Bad Day, or learn what cats are really saying in Cat’s Outta The Bag. Why a guest strip? There were logistical reasons. As you all know, two weeks ago I had surgery and then just under a week ago I flew to Arizona for a SciFi Con. So I was kinda laid up, drugged, and in pain while trying to get ahead on Spacetrawler before the trip (as it requires printers, scanner, light table, etc, I couldn’t take it with me). As the clock ticked down I began panicking, and asked Alan if he could save my hide. That was the logistical. But, really, I LOVE Ryan’s humor and cartooning sensibilities, and I might have even been dragging my feet a bit and asked him prematurely simply because I REALLY REALLY wanted to see what he’d do with my characters. I can tell you, i am NOT disappointed. 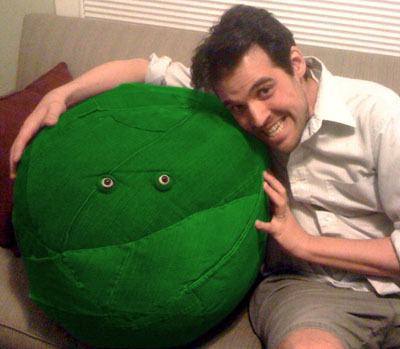 Oh, and here’s a picture of Faraday and I. Anyhow. I am back home, pretty much fully recovered, and Monday’s strip is lettered and penciled, so there will be no more delays. And I am FULLY AWARE I left you in mid-explanations of the big Eeb reveal, forgive me. Oh, and I want to read some good romance stories, or stories where romance plays a major part. Recommendations? Great art! I really love it! However, i still like yours far better Christopher! That is cool that you have recovered from your surgery so quickly. Joshing and knee-slapping aside, your (that which we’ve seen) artist type work is A GOOD THING in the best sense of capital letter usage. Little Dee (by you) still starts our log on day, every day. A (poorly framed, by us) Dee page- the autumn tree top perspective- hangs in plain sight over our highest traffic door, not the outhouse door. “Wizard of Id” overhead view has that spot. Perhaps when you attend our web comic event- guarenteed prime table spot by the fireplace, unless we are hosting a garage sale that day, then next to the cashier/exit- you might autograff/ottograph/ autograph (!) the cool autumn page . We’ve already said too much, and likely tried too hard. Spacetrawler Monday and Wednesday is better than “Oglaf” good, and better for the prude-dog. Better and better, pushing blue Monday to the side. Your food site is worth the time too. Glad to hear you’re recovering well! As to romance stories, this is an odd recommendation but a book I just loved: The Paris Wife by Paula McLain. It’s a new novel about Ernest Hemingway’s relationship with his first wife, and the whole story and storytelling was great. Plus it’s set in Paris in the 1920s with the Lost Generation. What’s not to love? I normally dislike guest strips because they deprive me of the one I was so looking forward to, but I got a good laugh out of this one (I hope that’s not wrong). It’s rather Douglas Adams-ish, really. You had better never do this to us, Chris. Try “The Pirate”, “The Adventure” and “The Cowboy”, all by Jayne Ann Krentz. They’re sort of a trilogy. Or, by the same writer, you may like “Crystal Flame”, “Sweet Starfire” and “Shield’s Lady”. If you can imagine a romance novel telling the story from the viewpoint of the beautiful wenches instead of the heroic men associated with Boris Vallejo illustrations, that’s sort of close. JKCarroll, the “Limitless” pill was a reference to the drug in the movie “Limitless” that lets people use the full capacity of their brain. Find a copy of Turgenev’s “On the Eve,” which is about a sculptor, a poet, a beautiful sensitive girl and a Bulgarian nationalist. The Penguin translation is probably the best and, no, it’s not one of those long Russian novels. It’s one of the short, sweet, sad ones that sticks with you forever. Have you read the Soulless (Soulless, Changeless, Blameless – with two more to come) series by Gail Carriger? They are steampunk where urbane vampires and werewolves are “out” in Victorian England. Funny, with a good splash of romance. 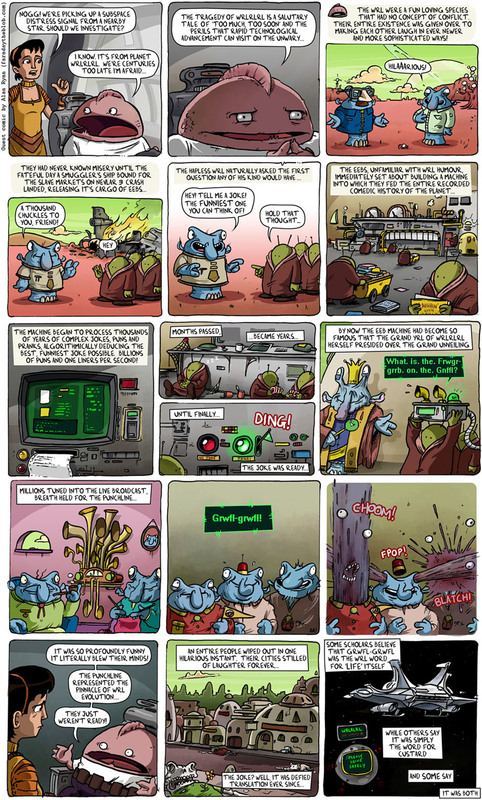 Faraday’s creator is doing a guest-strip – love it! Now will have to check out this spacetrawler dude properly whilst eating the meaning of life, i mean custard! Really well done, nailed the visual style and the feel of the characters. Nice job. Fun stuff. Custard? [i]Custard? [/i] Oh, sure! Custard you can do! But a lot of us are still awaiting the Great Butterscotch Bake-off. Good thing those attempts at italics didn’t crash the system, eh? It could have been worse. I could have been trying bold. @Marianna, @WarPig, @MikePeterson, @Hope, sound great! Thank you all for the recommendations! All reserved at the library! Good romance novel: The Time Traveller’s Wife, by Audrey Niffenegger. @Christopher If you ever get out Idaho way, there’s a fun convention called Fandemonium. It happens the first full weekend of August. Thanks, @Faizah! I’ve heard good things about it, reserved! Yep, Douglas Adams and Monty Python in a nice combination. I love the panel of minds exploding. For romance, try “Restoree” by Anne McCaffrey.